Today: got up earlyich and went to the Nordness park to study with Trine and Charlotte. Didn’t read much, I have no will power, but we’re going tomorrow as well. Anyways I tried something new, getting tanned. Now I’m red, not burned, but still: Lobster-city. I kind of understand what people se in it, I feel like I have accomplished something without really doing anything. Tomorrow I’m bringing my cap and I’m wearing my sunglasses all day and I’m seriously thinking about bringing a black umbrella. 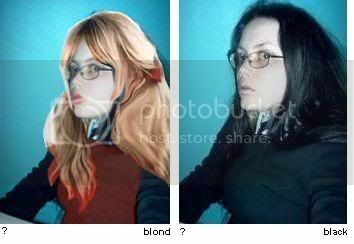 Yeah, I’m prototype snow white , and I’m reconsidering becoming blonde. I sort of need to go trough with it cause I’ve had this silly brown mop on my head for a year, don’t want it all to be wasted time where I could have been my black self. Bah anyways, what do you think? Please comment and tell me what to do.